Are you ready to discover a new Etsy crush? One thing I love about Etsy is their instant download feature. There are lots of great printables you can buy and download right away, so you can print them out and start using them. One printable shop I am loving right now is The Organized Kitchen. This mother-daughter duo creates all sorts of printables for your kitchen, from recipe cards to artwork to kitchen-themed shower games. This shop has so many cute printables to brighten up your kitchen! This is definitely one of my favorites. Isn’t it cute? 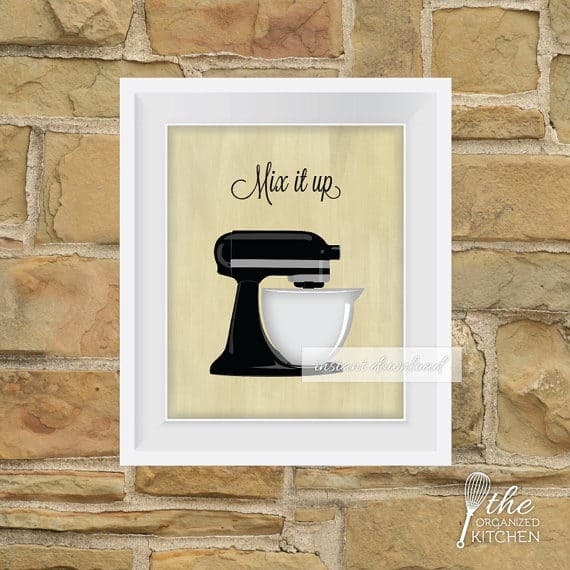 I’ve had my eye on a KitchenAid Mixer (affiliate link) forever, so I love this print. The only problem is I would probably want to bake something every time I saw it! The Organized Kitchen has some great recipe cards, too. I really need to get more of my recipes written down on cards like this so I can have my own cookbook in the kitchen. This would be a cute way to do that! I love making lists, and groceries are no exception. It would be cute to attach these to the fridge with a magnet so that you can write down what you need as you run out. I hope you enjoyed finding a new Etsy crush with me. You can enter to win $20 to spend at The Organized Kitchen below! All of their products are instantly available to print out after purchase, so this giveaway is open to everyone (not just U.S. residents). Hi there! Just out blog hoppin’ today and came across yours – glad I did – nice place you have here! These are great looking Etsy eye-candy items! Thanks for letting me know about them! Thanks for stopping by! I love finding a new Etsy shop and am always excited to share them with others. okay…i am in love with those recipe cards. I LOVE Etsy because you can find all kinds of stuff. Thanks for sharing – I will be checking them out! Aren’t they cute? Be sure to enter to win! These printables are so pretty! I especially love the recipe cards. Those are so cute! I’m popping over from our Triberr feed, and I love this shop, too! Thanks for stopping by! I’m glad you found a new Etsy shop to visit. You should totally get the kitchen aid mixer!! It makes baking so much easier. These are super cute printables! Love the coffee prints. I love the cute colors they come in, too! I’ll definitely be splurging on a KitchenAid sometime soon. KitchenAid mixers are the best! Definitely on my wish list. Those are SO cute! My husband is the one who uses our KitchenAid, so I might have to put one up to get him to bake something every time he sees it! You have a good point, if I had this print I would want to bake all the time! That could get dangerous. These are wonderful! You really can’t go wrong with Etsy these days 🙂 Thank you for sharing! Etsy has some really great stuff! I always love browsing. These are super cute. Thanks for sharing! Hahah, that is true! This print might have to do until I can get a real KitchenAid. I love the mixer print. I will definitely be checking out this shop. Even though we moved in about 4 months ago, our kitchen needs some love as far as decorating goes. That is one of my favorites, too. I’m sure you will be able to find some cute printables for your kitchen. I love those kitchen framed prints! So cute! I want to get some for my kitchen! They are so cute. I would have fun writing out my list with that printable. So cute! Your mom is lucky! I can’t wait to get a KitchenAid someday. I borrow my mom’s all the time. I love the it’s time for coffee print! 🙂 Great giveaway!! That is a new one they just added and I love it too! It makes me want to set up a little coffee nook in my house. 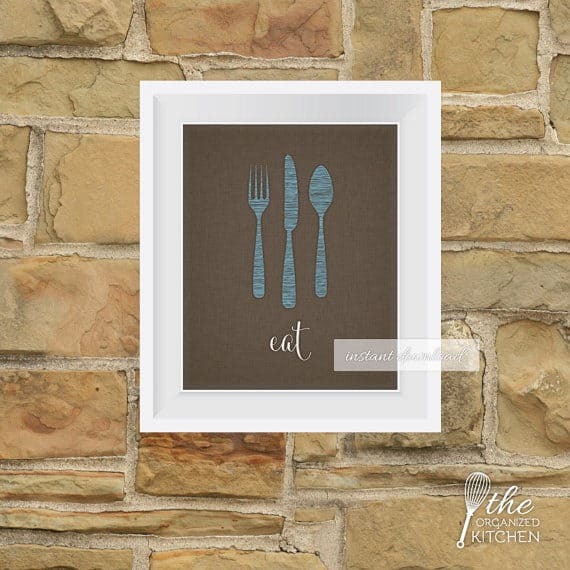 Love that “Eat” print, definitely need that for my kitchen! These are the cutest easy picks! I love the mix it up print! Great giveaway! Thank you! I am loving this shop right now. I wish I had more wall space in my kitchen, those are so cute! However, I didddd use peal and stick decals to decorate my mixer! That would be so fun! I’ve seen some cute decals for KitchenAid mixers. Absolutely any of those vinyl ones you use for your walls will work perfectly on a mixer. These are really cute. I agree, I love the mixing picture!! Me too! That is one of my favorites. The recipe cards!! Love love these! They just added a bunch of new designs! Be sure to check them out. I need some, too! They have lots of other cute designs, too. Those recipe cards are perfection. And the wall print outs! Such a fun and simple way to dress up a kitchen. I love how you can print them out right after you buy them! It doesn’t get any easier than that. I LOVE this printables! I need some cute new things for the walls in my kitchen! They are so cute, aren’t they! I am excited to hang some up in my kitchen. This is so cute, the recipe cards are my favorite. I’m so bad about actually writing down recipes. 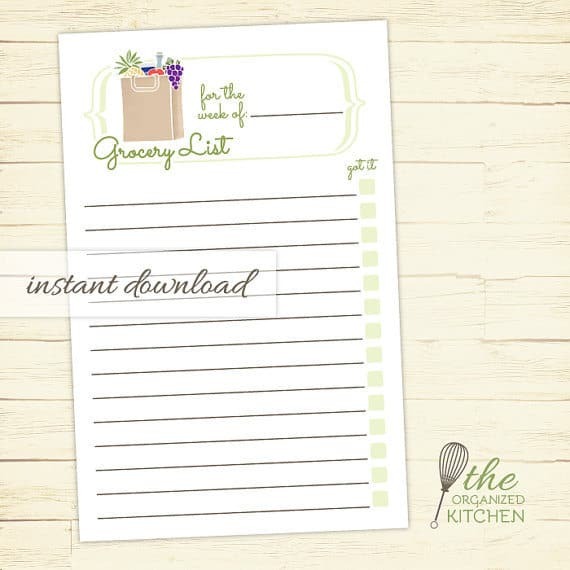 Maybe if you had these cute printables you would write more recipes down! I think it would work for me. oh my gosh those prints! 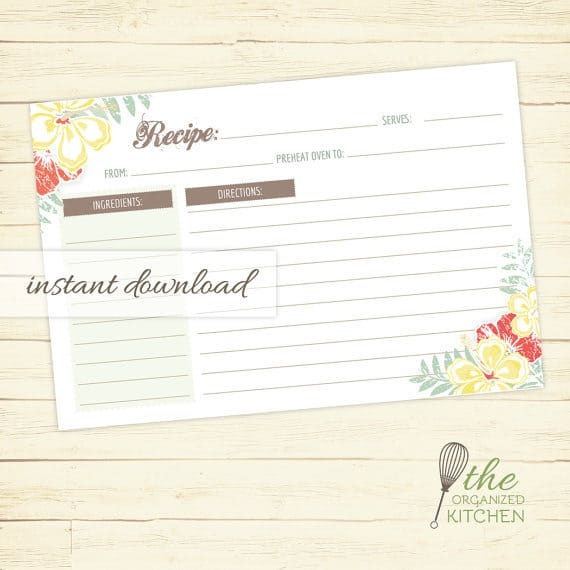 Love those recipe cards too, I have a cute little recipe box that is completely empty… maybe these would make me write some out! They just added a bunch of new recipe card designs recently. I am so excited to use some of them. I can’t wait to get one! Thanks for stopping by the giveaway. Good luck! Those are both really cute! I have actually never been to Etsy myself. You will get addicted! I love browsing and always find something I want. Everything is so cute! These are SO adorable!! I love the recipe cards! 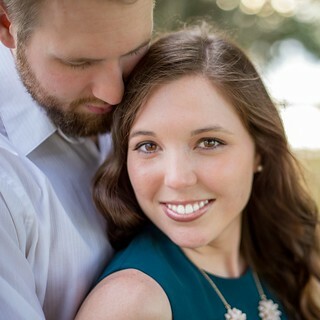 Aren’t they so cute! I just got some and I can’t wait to use them. I love that mixer picture. I should totally get that for my mom for Christmas! She loves her Kitchen Aid more than her kids! Etsy is a great place to find great gift ideas! This shop is one of my favorites.